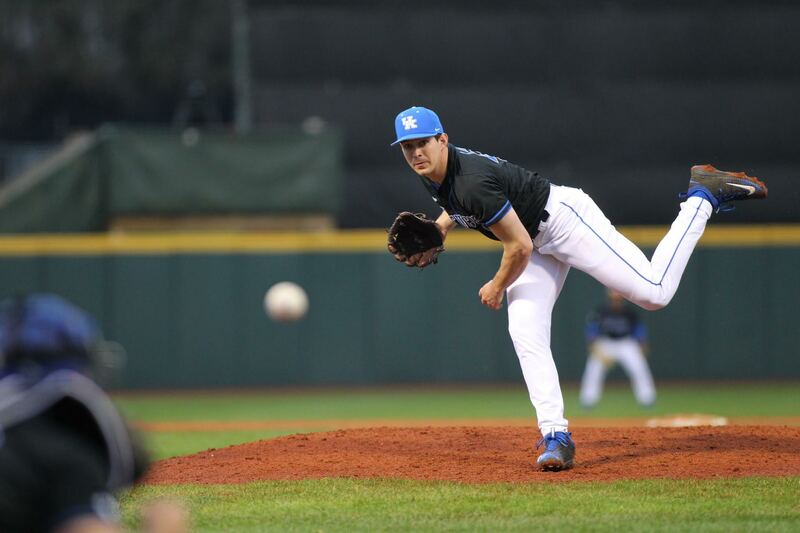 LEXINGTON, Ky. – Evan White cracked his first home run of the season and Brad Schaenzer pitched five scoreless innings as Kentucky posted a 12-0 shutout victory over Eastern Kentucky in its home opener on a damp day at Cliff Hagan Stadium. The Wildcats (3-5) jumped ahead on White’s opposite field blast just two batters into its half of the first inning, tacked on two more runs on junior infielder Riley Mahan’s two-run double and never looked back. White, a Preseason All-American who returned to the lineup in the last game after missing five contests, finished 3-for-4 with two runs scored, two RBI and a walk to go along with his home run. He’s now batting .700 on the season. Schaenzer, a left-hander making only the second start of his career, came into the game not having allowed a baserunner in his first 4.2 innings of work and pushed that streak to 16 batters before allowing a hit. It did not faze the left-hander, who pitched five scoreless innings to pick up the victory. Four UK relievers allowed just two hits over the final four innings to close of the win. White’s hitting prowess was on full display again but he wasn’t the only Cat to do significant damage. Mahan hit a pair of doubles and matched his career high with four RBI, while junior infielder Luke Becker scored twice and drove in a pair of runs. The Cats had 13 hits and have now scored 50 runs in their past four games, good for 12.5 a game. Schaenzer was terrific and has now allowed just four hits and two walks with 10 strikeouts in 9.2 innings of work. Freshmen Mark Doerries and Chris Machamer, redshirt freshman Austin Keen and junior Alec Maley struck out three, didn’t walk anyone and allowed just two hits combined while each working one inning. Bottom 1st – Evan White opened the scoring by going the opposite way for a solo home run over the RF wall. Kole Cottam had a two-out single, Tristan Pompey was hit by a pitch and Riley Mahan sliced a two-run double in LCF to score two. UK 3, EKU 0. Bottom 3rd – White and Zach Reks both singled to start the inning and advanced on walks to Pompey and Mahan, with White scoring on Mahan’s walk. After a pitching change, Luke Becker was hit by a pitch with the bases loaded to force in a run and Tyler Marshall singled to LF to score Pompey. Marcus Carson walked to score Mahan and Becker came home on a wild pitch. UK 8, EKU 0. Bottom 7th – Evan White singled to LF with the bases loaded to score Becker. UK 9, EKU 0. Bottom 8th – Mahan’s second double of the day – this time off the RCF wall – scored Marshall Gei, who pinch ran for Cottam. Becker drove in Pompey with an RBI groundout. Gunnar McNeill scored Mahan with a sacrifice fly. UK 12, EKU 0. · Preseason All-America junior first baseman Evan went 3-for-4 with his first home run of the season, scored two runs and drove in two runs. o White now has a 19-game hitting streak, just two shy of tying his career-long streak. o White has 161 career hits, moving him past Billy Grace and Matt Reida and into 23rd on the UK career hits list. · Junior infielder Riley Mahan hit two doubles and drove in four runs, tying his career-high set when he hit a walk-off grand slam against Alabama on 4/9/2016. · Junior infielder Luke Becker drove in two runs, the third time in as many starts he has driven in at least two runs. He has eight RBI during those last three starts (he appeared as a pinch hitter in the fourth game). · Junior left-handed pitcher Brad Schaenzer made his first start since 2015, earning the win with 5.0 scoreless innings. o He now has 9.2 scoreless innings to start the season. He retired the first 16 batters he faced this season. · Redshirt freshman infielder Zeke Lewis made his first career plate appearances but still does not have an official at bat after walking twice. · The shutout was the Cats’ first since blanking No. 2 South Carolina, 6-0, on 5/7/16 in Cliff Hagan Stadium. · The Cats have outhit their opponent in each of the past seven games. UK returns to Cliff Hagan Stadium on Wednesday to face Western Kentucky. First pitch for the game against the Hilltoppers is scheduled for 4 p.m. and fans can listen on the UK Sports Network via UKathletics.com and iHeart Radio or 98.5 FM in the Lexington area. The game also will be aired on SECN+.